Discover the momentous motor sports events that took place this weekend in history …..
1909: The Indianapolis Motor Speedway Corporation was incorporated with Carl G. Fisher as president. The speedway was Fisher’s brainchild and he would see his project through its inauspicious beginnings to its ultimate glorious end. The first race at the Indianapolis Motor Speedway took place on August 19, 1909, only a few months after the formation of the corporation. Fisher and his partners had scrambled to get their track together before the race, and their lack of preparation showed. Not only were lives lost on account of the track, but the surface itself was left in shambles. Instead of cutting losses on his investment in the Speedway, Fisher dug in and upped the stakes. He built a brand new track of brick, which was the cheapest and most durable appropriate surface available to him. The Indianapolis Motor Speedway would later be affectionately called “the Brickyard.” Fisher’s track filled a void in the international racing world, as there were almost no private closed courses in Europe capable of handling the speeds of the cars that were being developed there. Open course racing had lost momentum in Europe due to the growing number of fatal accidents. 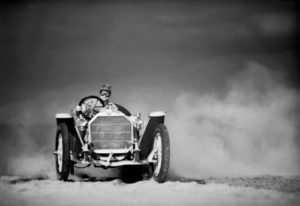 Recognizing the supremacy of European car technology, but preserving the American tradition of oval track racing, Fisher melded the two hemispheres of car racing into one extravagant event, a five-hundred mile race to be held annually. To guarantee the attendance of the European racers, Fisher arranged to offer the largest single prize in the sport. By 1912, the total prize money available at the grueling Indy 500 was $50,000, making the race the highest paying sporting event in the world. However, the Brickyard almost became a scrap yard after World War II, as it was in deplorable condition after four years of disuse. The track’s owner, Eddie Rickenbacher, even considered tearing it down and selling the land. Fortunately, in 1945, Tony Hulman purchased the track for $750,000. Hulman and Wilbur Shaw hastily renovated the track for racing in the next year, and launched a long-term campaign to replace the wooden grandstand with structures of steel and concrete. In May of 1946, the American Automobile Association ran its first postwar Indy 500, preserving an American tradition. Today, the Indy 500 is the largest single day sporting event in the world. 1911: Mercer recorded its first major racing victory as Charles Bigelow in a Type 35R raceabout won the Panama Pacici Light Car Race in San Francisco, California. 1947: The Swedish Winter Grand Prix was held on a circuit surrounding a Swedish Air Force site at Rommehed. Only three cars, all visiting British ERAs, finished after the ship carrying the bulk of the grid was not able to make its destination. The race was won by Reg Parnell driving an ERA A-Type. 1952: A two-way radio was first used in NASCAR competition. Al Stevens, who operated a radio dispatch service in Maryland, drove in the 100-mile Modified and Sportsman race at Daytona while talking to pit boss Cotton Bennett. Stevens finished 27th in the 118-car field and third in the Sportsman class. Tim Flock was flagged the winner, but was disqualified when NASCAR technical inspectors find “improper” roll bars in his 1939 Ford. Jack Smith was declared the ­official winner. 1958: Jimmy Bryant, driving a Mercury, won the USAC stock car race on the dirt track at the Arizona State Fairgrounds in Phoenix, Arizona, USA. 1958: S G Allen won the Baskerville Grand Prix held in Hobart, Australia, driving a Fiat Special. Baskerville Raceway, the oldest continuously operating circuit in Australia, is set in a natural amphitheatre with spectators able to sit in their cars and view the entire circuit. The track is a tight and demanding 1.25 miles in length that includes a fast straight, off camber corner and a relatively blind corner at the top of a steep hill. 1962: Rod Perry won the Modified Stock Car race over Bobby Allison and Jackie Evans at the Palmetto Speedway in Miami, Florida, US. 1964: Two time World Champion Jack Brabham drove his Brabham BT7A-Climax to victory in the Australian Grand Prix on the 1.9 mile Sandown Park circuit. The race was round 5 of the inaugural Tasman Cup series. It was Brabham’s 2nd straight Australian GP win and 3rd overall. 1969: Jochen Rindt splashed to his second win of the ’69 Tasman Series season when he won a rainy 45 lap, 101.5 mile round 6 on the 2.25 mile Warwick Farm circuit, Sydney, New South Wales, Australia. The race also decided the Tasman championship as Chris Amon clinched the title when he and his lone challenger Piers Courage were eliminated in a first lap incident. 2000: Sylvester Stallone disappointed F1 fans when he revealed that his highly anticipated motor racing film, Driven, would in fact be based on the American CART Champ Car series. He had spent more than two years visiting grand prix for research but said F1 was too closed and Bernie Ecclestone too powerful for such a project to work. “I apologise to fans of Formula 1, but there is a certain individual there who runs the sport that has his own agenda,” he said. 2006: Ex-Formula One driver Gerhard Berger bought a 50% stake in Toro Rosso. The deal saw Red Bull boss Dietrich Mateschitz purchase 50% of Berger’s shipping company in return. The team improved under Berger’s part ownership and surprised the F1 establishment by winning the 2008 Italian Grand Prix. However, just a few months later Berger sold his share back to Mateschitz. 1901: Henri Farman recorded his first racing victory, winning the Pau-Peyrehorade-Pau road race for touring cars in an 8 hp Darracq. 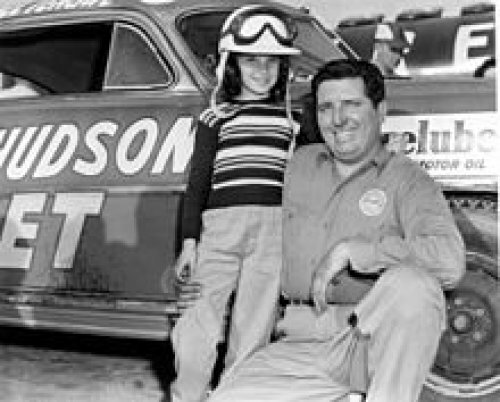 Marshall Teague beside the Fabulous Hudson Hornet with his daughter at the Daytona Beach. 1952: Daytona native Marshall Teague won the NASCAR Grand National race on the 4.1 mile beach and road course for the 2nd straight year. The scheduled 160 mile race ended 2 laps early due to an incoming tide. Teague led from lap 2, crossing the line 1 minute, 21 seconds ahead of Herb Thomas. Both were in identical Hudson Hornets owned and prepared by Teague. Teague wasn’t allowed to compete until he paid a $574.50 fine for driving in a non-NASCAR race in November 1951. The event also saw Joie Ray become the first black/Afro-American driver to compete in a GN race. 1955: Racer and heir to a gold mining fortune, “Grandpa” Eddie Hearne died aged 68. Born in Chicago, Hearne participated in the inaugural Indianapolis 500 and later was a long-time Duesenberg factory-backed driver. He made 106 AAA Championship Car starts and continued driving until 1927, winning 11 Champ Car races and the 1923 National Championship. 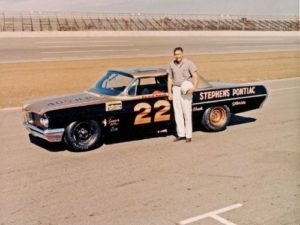 1962: Fireball Roberts started 10th but had the lead by the backstraight and held off a last lap surge by Joe Weatherly to win the 2nd ‘American Challenge Cup’ race by a half car length. The 10 lap special event on the 2.5 mile Daytona International Speedway was open only to winners of 1961 NASCAR GN “superspeedway” events. 19 drivers won GN races in 1961, but only 10 started. Western stars Lloyd Dane and Eddie Gray declined towing 3,000 miles for a race that only paid $1000 first prize, Lee Petty was recovering from injuries and Emanuel Zervakis was without a ride. Rex White, Bob Burdick, Cotton Owens, Junior Johnson and Jack Smith all were on hand but elected to skip the race. 1963: Fred Lorenzen held off Nelson Stacy’s late charge to win the 10 lap ‘NASCAR Race of Champions’ at Daytona International Speedway. The Ford duo dueled the entire distance with Lorenzen edging Stacy by a half car length. Lorenzen averaged a record 163.29 mph. Larry Frank, Fireball Roberts, Ned Jarrett, Jim Pardue and Bobby Johns filled out the field of 5 Fords and 2 Pontiacs. 6 eligible drivers (Joe Weatherly, Richard Petty, Rex White, Jack Smith, Jim Paschal and Junior Johnson) did not compete. The declining entries led to this being the last “winners only” NASCAR race until the format was revived in 1985. 1974: Teddy Pilette drove his Chevron B24-Chevrolet to victory in round 5 of the Tasman Formula 5000 Series, held on the 2.0 mile Surfers Paradise International Raceway, Australia. The race was delayed an hour and a half and nearly didn’t take place at all due to drivers protesting track conditions. The circuit had been under water a week before and a preliminary Sedan race broke up the asphalt in two corners, one of them a 130 mph turn. Organizers took drivers around the course and showed them the holes and the drivers rebelled. At one point, it was suggested that points be awarded based on grid positions, but eventually white paint was used to mark a new course avoiding the holes. Pilette (reported as “very, very angry”) started 3rd, passed pole winner Max Stewart and 3 time defending series champ Graham McRae down the main straight in the first two laps and pulled away, simply disappearing while everyone else drove cautiously. The 3rd generation driver stormed off in a huff to win the 100 mile race by a large margin over Peter Gethin’s team car, giving Count Rudi van der Straaten’s VDS team a 1-2 finish. Frank Matich’s Matich A53-Repco/Holden finished 3rd in his first outing in his new car (the car debuted the week before but Matich was unable to drive his new creation). Gethin led Stewart by 2 points and John McCormack by 3 with 2 rounds remaining. 1979: Richie Evans won the second night Modified feature of the World Series Of Asphalt Stock Car Racing at the New Smyrna Speedway, New Smyrna Beach, Florida (US). Merv Treichler was second followed by Dave Nichols, Kenny Bouchard and Jamie Tomaino. 1987: American driver Andy Linden (cover image) died aged 64. After serving as a US marine, this colossus of a man raced in seven grands prix when the Indianapolis 500 was a part of the Formula One championship. He had shown huge amounts of skill as a sprint and midget racer and finished in the top six at three of the Indy 500s he competed in. His career ended when he was left brain-damaged after a shard of metal pierced his helmet during a race in 1957. He was confined to a wheelchair but learned to walk again before his death.